Continued from Teenage Mutant Ninja Turtles #7. The Baxterbot is unimpressed with Don and Nobody’s arrival and tosses a section of building onto Nbody, who goes down but isn’t injured seriously. Stockman remarks that the police are probably on their way, so he must be on his way, but before he goes, he attempts to launch some rockets at Don and Nobody – fortunately, something goes awry with the machine and the rockets explode while they’re still inside Baxter’s shoulder, blowing his right arm off. Angry and alramed, Stockman grabs Raphael and heads for the ledge of the building they’re all on. Nobody grabs a big gun and heads off in pursuit of the Baxterbot, while Don attends to Leonardo, Michaelangelo and Casey. Nobody faces off with Stockman, who threatens to drop Raph from the roof if the vigilante doesn’t drop his weapon. Nobody drops the gun, and in response, the robot drops Raph – over the edge! As Nobody screams in protest, Stockman opens fire on him. Upon seeing the gunfire, officers in an approaching helicopter open fire on the mechanical monster, which leaps into mid-air and catches the foot of the craft, causing it to careen out of control and crash into the ground below. The robot soon emerges from the wreakage and walks off, heavily damaged but still functioning. Leo, Mike and Casey head back to their apartment while Don goes off to find Nobody. Donatello is extremely angry that Nobody didn’t protect Raph, but the vigilante explains that there was nothing that he could do. Don asks if Nobody searched for Raph, and the cop explains that he has, but he disappeared without a trace. Nobody suggests that they head back to April and Casey’s place, as Raph will turn up there if he’s okay. Don worries that the police may have taken his brother captive, and Nobody explains that he can find out easily enough if that’s the case. Nobody then tells Donatello not to jump to conclusions and the two split up to make one last search of the area for Raphael. The Baxterbot has made its way back into the sewers, but Stockman isn’t feeling well. Alert warnings sound in the machine and it collapses, sending Baxter into darkness. Raph wakes up, strapped into some sort of hi-tech hospital bed. 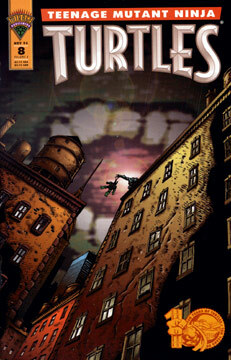 Continued in Teenage Mutant Ninja Turtles #9.